What does FSU STARS do? The mission of the STARS (Students & Technology in Academia, Research & Service) Alliance is to increase the participation of women, under-represented minorities, and persons with disabilities in IT/computing disciplines through multi-faceted interventions. 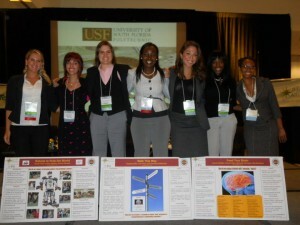 At FSU, these interventions focus on projects and programs that start at elementary school and progress through graduate school and on to IT/computing careers. Educate and bring awareness to K-12 about IT/computing education programs, careers, service, etc. Recruit and retain under-represented populations in post-secondary computing programs and increase awareness of IT/computing disciplines and careers. Bridge student readiness for IT/computing and increase the number of undergraduates who enter IT/computing graduate school or the workforce. STARS Computing Corps is a national community of regional partnerships with a mission to grow a diverse 21st century technology workforce. The Corps is a framework for integrating engagement into computing departments for recruitment and graduation of undergraduate and graduate students. 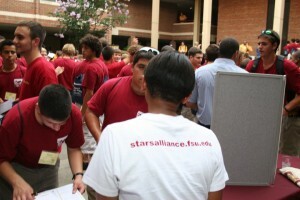 Utilizing our innovative STARS Leadership Corps program, a curricular or co-curricular service-learning program for college students, Corps students collaborate with regional K-12 schools, industry, and community partners to inform, engage, and prepare upcoming students for entry and success in college computing programs. Through student-led regional engagement that includes peer mentoring, team projects, and research experiences, STARS Computing Corps students are emerging as the future innovators of tomorrow.